“What’s it like to be John Piper’s kid?” That question is one that Barnabas Piper lets us know is better not asked. Pastor’s kids like Barnabas would far rather you get to know them personally than ask them about their dads. In fact, he lets us know a lot about growing up as the child of a pastor in his new book, The Pastor’s Kid. Open, honest, challenging, and sometimes painful, this new work from the son of popular pastor John Piper is a very helpful tool for pastors and their families to work through. Barnabas has a knack for helping us to see things from the point of view of the pastor’s kid (PK). He shares with us some valuable insights about things that might seem innocent and helpful but which are in fact discouraging and awkward for a PK. The author shares joys and pains from his own life as well as from the lives of many other PKs in order to help preacher dads understand ways to better communicate with and set expectations for their children. As a pastor myself, one with children I might add, I found this book thought provoking and helpful. One thought that particularly got my attention is that of a PK being known of, but not actually known as a person, by many in the church. Barnabas tells of a time when his dad shared an illustration from Barnabas’ own childhood. This was not one of those embarrassing illustrations for which a pastor would think he needed to get special permission. But what John Piper did not understand at the time was that his telling of Barnabas’ story actually made people in the church, and subsequently on the Internet, more acquainted with the details of Barnabas’ life than he would eventually be comfortable with. Thus, Barnabas would have people he did not know come up to him and comment to him or ask about personal details of his life. These people assumed a familiarity with him and rights that they had not earned through personal investment or friendship. Much of the book is devoted to challenging pastors to help their kids to be seen and thought of as “normal.” It is unfair for a pastor’s kid to have extra expectations placed upon him or her for advanced Bible knowledge, super-spiritual behavior, or a calling to ministry. Pastor’s kids are normal, human, flawed, and growing young men and women. They will fail and succeed, behave well and act out, just like any other kids in the church. While a pastor is called to raise and shepherd his own family well, the pastor’s kids are still going to be cut from the same cloth as all other human kids, complete with a sin nature, puberty, and a need to figure life out for themselves. The biggest weakness in this book to me is the fact that we do not get to see enough of the positive aspects of being a pastor’s kid. 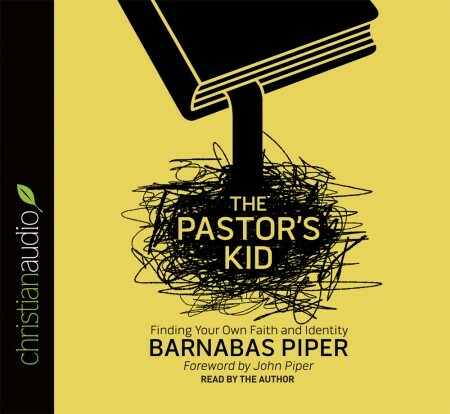 Though Barnabas talks about some of his joys in his relationship with his dad, much of the book focuses us on the failures of pastors and churches to allow PKs to be kids. Obviously, the intent of this work is to swing hard and to get the attention of pastors who may be oblivious to their kids’ needs, and so I am certainly willing to say that this is not a major flaw. However, I would have liked more, perhaps even a whole chapter or two, on the good side of the ledger. All in all, I would highly recommend The Pastor’s Kid to any ministry family. It would also make a great book for other church leaders to read. Deacons, lay elders, and Sunday School teachers could learn much of what their own church’s PKs are going through if they gave this book a quick read. I received a free audio copy of this work from ChristianAudio.com as part of their reviewers program. This book was read by Barnabas Piper. While I typically do not enjoy a book read by its own author, Barnabas has a good reading voice and pace. And, because the stories are his own, I find it actually quite helpful to hear his stories with his own emotion attached.